Their uniforms portray the picture…….of commitment, service, sacrifice, and valor and they are prepared to risk their lives at any moment as the guardians of freedom. These great men and women o f our nation’s military deserve our thankfulness, praise, and deepest respect for bearing the cause of liberty. 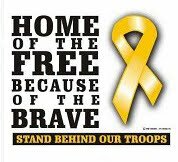 Their endless duty as protectors of our sovereignty allows us the independent way of life that we take pride in and enjoy daily. 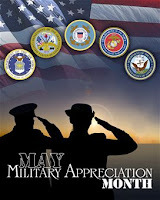 May is National Military Appreciation Month. It’s your opportunity to take a closer look around you and show your appreciation to those who have held the line in the past and present, and perhaps inspire those who will serve in the future. There isn’t an American alive today in all walks of life that haven’t been touched in some way by the military service of family members, friends, neighbors, co-workers, and acquaintances. We are a nation full of Patriot sons and daughters who have served as veterans or currently serving on active duty. Let us also not forget their families, who stand with them in support by keeping the home fires burning until they safely return. This month, let us truly reflect on what it means to be the land of the free and the home of the brave by making an effort to seek out those who have earned our thanks and salute. Our military are deserving heroes, and are always willing to endure the most difficult conditions at home and abroad to sustain our hard won liberty. Listen to their stories that speak of service and sacrifice, and you’ll have a refreshed perspective on what it truly means to walk in the freedom that you hold dear. On Memorial Day, May 30th, take a moment to pause and reflect on those who bore the heavy cost of freedom, and laid down their lives for that cause throughout our country’s history. Those military heroes gave up all their tomorrows so that you could have your todays. God Bless our Military!